Today I took out the garbage. Few husbands can ever boast thus. My Rosemary does it most of the time but today she said, “Alex, tomorrow they come to pick up the blue box. Can you take it out before the light goes? My knee is buckling today. I don’t think I can handle it.” And so I took out the garbage. After 47 years of being together even this idiot would understand that there has to be a lot of give and take. These days I feel isolated in Vancouver. I go to baroque concerts on my own. Rosemary is not keen nor is she keen on sopranos or modern dance. And yet wives, my wife in particular, can surprise. She read as many Andrea Camilleri novels that I could find and we have seen 20 of the series (based on those Camilleri novels) Montalbano, the Sicilian police inspector who likes to dine alone and has a fondness for sea food. I would have never thought that my Rosemary would get hooked on Camilleri. Is Michael Dibdin the next possibility? Rosemary and I are crazy about Rachel Maddow and we watch her show almost every day. We sit with our late lunch/early dinner at 6 to watch our favourite lesbian. Consider that when I met Rosemary in 1968 I did not know I was going to eventually marry a proto-feminist. Only Mark’s Work Warehouse has saved me from hemming my jeans. They sell exactly my length. There is no way Rosemary will sow a button or hem jeans or cook. After fighting with her for years I finally realized that the only way I could eat well was to cook. So I do the cooking. She hates using the vacuum. I vacuum. She scrubs the impossibly white kitchen floor I sometimes wash the car. Gardening was a bone of contention in 1986. “That’s your flower bed, Rosemary. You water it.” Or she might have asked, “When are you going to mow? Some of the plants were hers and some were mine. We have long ago given up on owning parts of the garden and we do the work together. But I suspect our neighbour must think we (especially me) are an abusive couple as we still do a lot of arguing. “Rosemary, your hardy geraniums and your Anthriscus are weeds. They are taking over my hostas.” “Alex, don’t shake your spent roses on the lawn. I have to pick up the petals.” I am especially infuriated (still) when she asks, “Have you watered the window boxes?” I am tired of telling her, “That’s not my domain.” And so on and sometimes (rarely) we sit together on the metal bench with her cat Casi-Casi who is the great soother. Where it is important it seems we have it made. We agree on the few TV series that we watch (we rent or take out the DVDs from the library). She does not, to my chagrin want to watch the World Cup. We both agree on not having a remote interest on any American series. We did rent a few of the original British House of Cards but we have avoided the American. We know nothing about the Game of Thrones (too much violence for Rosemary). In short we agree on the few series we do watch and she trusts me completely on my film choices (again Limelight Video or the Vancouver Public Library). Today I was thinking why it is we love the Italian series Montalbano and the British one, Foyle’s War. Since we see them on DVD it means that we have a complete episode that runs around an hour and thirty Luca Zingaretti (Montalbano) and Michael Kitchen (Inspector Foyle) talk little, brood a lot and just an “Ah!” will reveal more of what they are thinking than many words. We like these series because the car chases and the violence are understated. Both men are elegant, full of humanity and ethics that are impervious to just about anything. Alas, there is no more Foyle’s War for a while and if we want to see more Montalbano (Limelight gave me credit for the three Montalbanos I purchased on line) I will have to order them. So what’s next? But Rosemary and I both love Wallander. I especially like the fact that Wallander’s father (who has Alzheimer’s) is played by my fave David Warner. We are trying to figure out how they make Branagh’s skin look so white (almost cyan) while his eyes are invariably bloodshot. Do they keep him awake for days before they shoot? 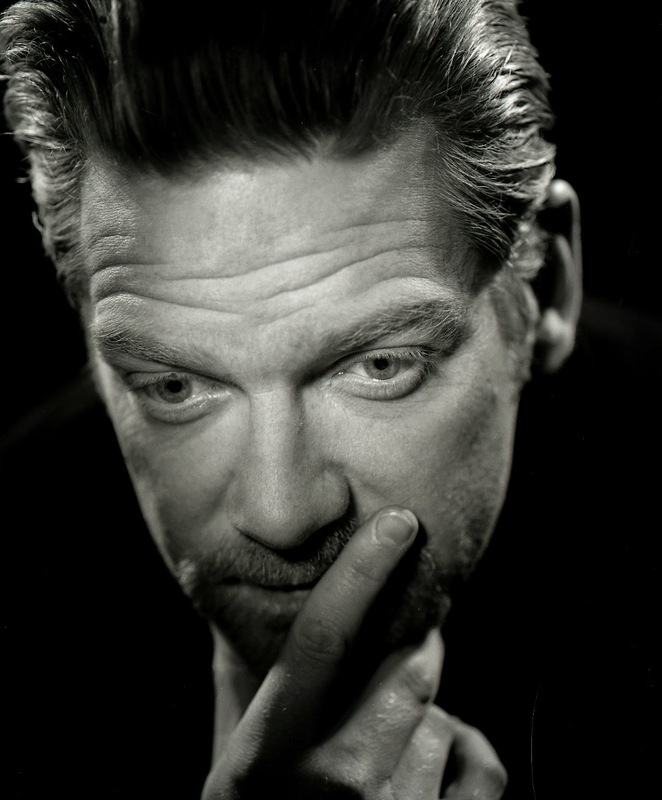 Branagh’s Wallander, cries, broods, shouts and rarely smiles. We love him. We have three more to watch. I will make sure the menu on our TV trays is a good one. What’s next? We will have to tackle the Henning Mankel novels.